We've had a few questions about whether users are able to use their mobile devices with the new CourseSites experience. The answer is "Yes!" The Ultra experience is responsively designed, meaning it adjusts to a wide variety of screen sizes for mobile devices, tablets, laptops, and desktops. It also pairs with the Blackboard app for students and the Blackboard Instructor app, so you and your students can easily stay connected and informed as well as complete common tasks from anywhere. Simply download the app, type CourseSites (NEW) by Blackboard as the school name, and use your CourseSites username and password. View the instruction guide for more details on the mobile app. I've submitted 2 "support tickets" from within CourseSites by using the question mark icon on the bottom right and then clicking Support Ticket. I haven't received any confirmation that they were submitted or looked at - does this help feature actually work? If you haven’t looked at Learn with the Ultra experience for a while, it’s time to take another look. Find out why in our latest blog post and try it out using the new CourseSites (formerly Educator Preview). Over 11,000 institutions in 48 countries are using Educator Preview to explore the Ultra experience for Blackboard Learn. We are now excited to share that Educator Preview is undergoing development to equip you with the ability to teach and deploy live courses online – for free. The platform will still serve as the premier place to test drive the Ultra experience, but with the added bonus of having a course delivery option for you to teach with either the new Ultra Course View or the Original Course View.. You will be able to start teaching live courses in late June. To reflect the new vision and maturation of Educator Preview, we will be rebranding the platform as CourseSites and refreshing the log in page as well. In the coming months, expect multiple communications from the Blackboard Learn Team with updates on the development of the new CourseSites platform. If you have questions surrounding this initiative, please email us at community@blackboard.com or engage with us via the Blackboard Community site. We look forward to introducing you to the new CourseSites platform! Instructors often need flexibility with how timed tests and assignments are delivered to students for a variety of circumstances. 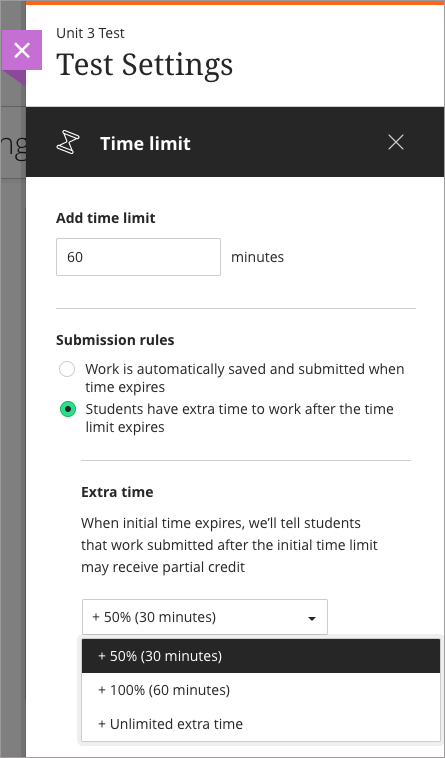 Therefore, we’ve afforded instructors the ability to allow students to continue working on a timed test or assignment after the set time expires. Students and instructors desire a quick and easy way to understand what activity has transpired since last visiting a course . Are there new discussion posts? Is there a new assignment? Rather than opening each item to view this information, users can quickly identify new course activity directly on the Course Content page via a visual indicator. This enhancement is a direct response to client feedback. Students and instructors now have the ability to receive notifications via SMS Text message. This opt-in feature allows you and your on-the-go students to stay current on important updates while outside of the LMS. This feature comes at no additional cost to the institution. However, standard messaging rates and data charges from the recipient’s carrier can apply. Instructors yearn to provide tailored pedagogical experiences for their students. To support this, we have introduced functionality to Ultra courses to define rules that control the release of content to students based on performance. An instructor can set conditional availability for a content item or folder and release it once a student achieves a certain score demonstrating a strong understanding of the learning outcomes. With your round-the-clock workload in mind, we’ve created a workflow which easily allows instructors to copy content between Ultra courses. This functionality saves time and allows you to pick and choose the content you want to bring into a new course. Because sometimes there’s no need to reinvent the wheel. The Blackboard Learn Team is giving away a free pair of jazzy Blackboard socks to the first 50 individuals who reveal their favorite Blackboard Learn with the Ultra experience feature. As many of you know, our product management team is continuously pushing out new features, fixes and updates to Educator Preview to exhibit the new modern, intuitive, and efficient user interface. We’ve pushed out quite a few updates within the past several months, so we want to take a moment to gather some feedback from you. Don’t have an Educator Preview account? No worries. Visit preview.blackboard.com to register and to join in on the fun. Tracking classroom attendance is of importance to instructors for a myriad of reasons such as: detecting at-risk students, federal financial aid and accreditation compliance, and to support instructor pedagogical preference where attendance is a component of a course grade. In Ultra courses, a gradebook column is added when the instructor begins taking attendance. That attendance column provides the overall attendance score in the gradebook, where it can be included in the student’s overall grade. Instructors now have the ability to easily embed videos directly into their courses to help heighten student engagement, tailor the course experience, and create an all-around improved student experience. Simply paste the video source, add alternative text, and hit save. The editor automatically embeds the video so it appears alongside content. Students can watch the video within the same window, without having to navigate to the video's host site. Don’t believe it’s this easy? Login to Educator Preview to test drive it for yourself.